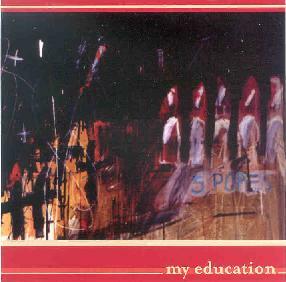 My Education - "5 Popes"
First full length from this Austin TX - based septet, which features some former and/or current members of the groups Stars of the Lid and Ultrasound, although this doesn't really clue one in to what's going on sound-wise. The first coupla tracks, "Concentration Waltz" and "Lesson 3" start off in relaxed, strummed melodic post/indie/whatever rock mode, gradually climaxing with nice bits of sound sheet squall. Sure it's formula, but what the hell isn't? It's also well done, and if this is a formula that appeals to you most likely you will like these. The mellow intro thing goes out the window on track three, "Nightrider meets the Waterfall" a very dense piece driving space rock with definite emphasis on the rock. The final two tracks, "Deep Cut", and "Crime Story" split the difference, with more midtempo paced riffage. It's all nicely done, at times reminiscent of such contemporaries as Radiohead or maybe Mogwai. All the songs are instrumental, run about 7-10 minutes, and are augmented with keys, violin, viola and glockenspiel, which adds a more arranged and developed feel that helps to raise it above the average. Things remain melodic throughout. Could be of equal appeal to fans of the more mature end of indie spectrum and space rock fans alike. For more information you can email My Education at: my_education@hotmail.com. Contact via snail mail c/o Brian Purington; 7005 Daugherty; Austin, TX 78757.